You are here: Home / competitions / Win Guestlists and Bubbly for Slide & Get Diverted New Years’ Eve. 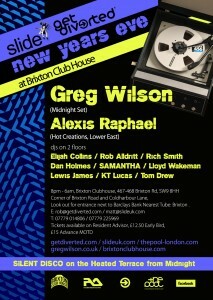 After a great year at Brixton Clubhouse, hosting the likes of Dimitri From Paris, Anja Schneider, Radio Slave, Felix and Al Hot Chip, Aeroplane and Ralph Lawson, Get Diverted & Slide join forces once again on New Years’ Eve with a fantastic line-up, spearheaded by disco and edit legend GREG WILSON. Joining us for the 3rd time at the venue, this will be Greg’s first appearance in the club space rather that on the terrace, and he will be playing the MIDNIGHT SET! “The Original Master Of Re-Edits” Norman Jay M.B.E. Greg began DJing in 1975 and is regarded as one of the most important figures on the UK dance scene. He enjoyed hugely popular residencies in the early eighties at Wigan Pier and Manchester’s majorly influential Legend. He was a pioneer of mixing in the UK and in 1983 he became the first ‘dance music’ DJ hired for a regular weekly session at Manchester’s now legendary Hacienda club. Greg was instrumental in breaking the new electronic, post-disco records coming out of New York, a sound he has dubbed ‘Electro-Funk’. In 2003 he set up his own website (www.electrofunkroots.co.uk) to document this crucial era in the evolution of dance culture and, having retired from DJ work at the end of 1983, Greg returned to spinning tunes two decades later, receiving plaudits for his red-hot appearances at renowned nights including Electric Chair, Horse Meat Disco and Fabric. In 2005 Tirk released ‘Credit to the Edit’, a compilation of re-edits spanning Greg’s entire career, some even original tape edits from way back when. Greg was the first DJ to mix live on British TV (The Tube in 1983), putting together the first UK radio mixes of their type for Piccadilly 261 in Manchester (beginning 1982) and showing a certain Norman Cook, then a young aspiring DJ called Quentin, how to scratch (Dec ‘83). In January 2009 Greg’s reputation was further enhanced when his Essential Mix on BBC Radio 1 became something of an instant classic, receiving almost universal acclaim and, in the process, providing the perfect way to commemorate the 5th anniversary of a remarkable renaissance. Credit To The Edit Volume 2 was released in November 2009. Supporting Greg is Alexis Raphael, co-founder of Sunday party Crèche, which has become one of the leading parties in London this year, their recent ‘Big One’ party had Jamie Jones and Kerri Chandler headlining. Alexis is also set to release an EP on the hottest label around, Hot Creations, early next year. Plain and Simple have an amazing prize to give away for this event. We’re giving away 5, yes 5, guestlist places and a bottle of bubbly to one lucky winner, meaning you can win your NYE night out for you and all your mates! To enter, simply tell us. What is the name of Greg Wilsons famous website? Closing date for entries is the 21st Dec, good luck! Win 5 Nights in Ibiza with Ibiza Rocks! Win! Tickets to the Spectrum Summer Warehouse party- with Chase & Status, Nero, Kissy Sell out and more!